The 2018 edition of the annual Friends of Armed & Dangerous FTF will be held in room 821 of the Southfield Westin in Southfield, MI between 9 p.m. and 12 p.m. this evening. If you are at Penguicon, or in the neighborhood and can talk yourself yourself in, come join us for an evening of scintillating conversation and mildly exotic refreshments. I greatly enjoyed Thomas Mays’s first novel, A Sword Into Darkness, and have been looking forward to reading the implied sequel. His new collaboration with Chris Kennedy, The Mutineer’s Daughter , isn’t it. Instead, we get a crossover YA/space-opera that is a bit cramped by having been written to the conventions of the YA form. Also because, if a reliable source is reliable, it was Mays writing to an outline by Kennedy. Where Mays’s heart is – in the space-opera parts – the result has some sparkle and a bit of originality. In the YA parts it is competently executed but strictly from tropeville. For a plot and setting teaser see its Amazon page -accurate enough, if empurpled. It is also worth noting that this is another book in which the author(s) carefully studied the Atomic Rockets website and gained much thereby. This is not a bad book; Mays gave it craftsmanlike attention. If you like things going boom in space, you will probably enjoy it even if you are ever so slightly irritated by the insert-plucky-girl-here plot. It proceeds from premise to conclusion with satisfactory amounts of tension and conflict along the way. As long as you don’t set your expectations much above “genre yard goods” it is an entertainment worth your money. But I’m left thinking that not only can Mays do better on his own, but in fact already has. I want that sequel. Progress in UPSide, and a change of plans. Much has changed in UPSide over the last week. Ground has been broken on the software; one key piece of the control daemon, the policy state machine, now exists. The design of UPSide is coming together very nicely. We don’t have a full parts list yet, but we do have a functional diagram of the high-power subsystem most of which can be expanded into a schematic in a pretty straightforward way. If you want to see what we have, clone the repo, cd to design-docs, make transactions.html, and view that in a browser. Note that the bus message inventory is out of date; don’t pay a lot of attention to it, one of the design premises has changed but I haven’t had time to rewrite that section yet. We’ve got Eric Baskin, a very experienced power and signals EE, to do the high-power electronics. We’ve got me to do software and systems integration. We’ve got a lot of smart kibitzers to critique and improve the system design, spotting problems the two Eric’s might have missed. It’s all going well and smoothly – except in one key area. UPSide needs a battery technologist – somebody who really understands all the tradeoffs among battery chemistries, how to spec battery types for different applications, and especially the ins and outs of battery management systems. Eric Baskin and I are presently a bit out of our depth in this. Given time we could educate ourselves up to the required level, but the fact that that portion of the design is lagging the rest tells me that we ought to recruit somebody who already knows the territory. Any takers? No money in it, but you get to maybe disrupt the whole UPS market and and certainly work with a bunch of interesting people. My wing chun sifu played a classic martial-arts-master trick on me tonight. Stop logging in local time! Andrew Klavan has a thoughtful essay out called A Nation of Iagos. In it, he comments on William Shakespeare’s depiction of Jews in a way I think is generally insightful, but includes what I think is one serious mistake about the scene from The Merchant of Venice in which the (black) Prince of Morocco woos Portia. He chooses poorly, fails her father’s test, and as he leaves Portia mutters “May all of his complexion choose me so.”, which Klavan reads as a racist dismissal. I winced. I tried to leave a comment on the essay only to find when clicking “Post” that it required a login on the accurséd Facebook, with which I will have no truck. There’s a lot of buzz about Iain Banks’s Culture universe lately, what with Elon Musk naming his drone ships in Banksian style and a TV series in the works. I enjoyed the Culture books too, but they were a guilty pleasure for me because in a fundamental way they are bad SF. The UPSide project, announced here two weeks ago, has come together with amazing speed. * A hardware lead – A&D regular Eric Baskin – with thirty years of experience as a power and signals engineer. He is so superbly qualified for this gig that my grin when I think about it makes my face hurt. * A high-level system design (about which more below) that promises to be extremely capable, scalable, flexible, and debuggable. * A really sharp dev group. Half a dozen experts have shown up to help spec this thing. critique te design docs, and explain EE things to ignorant me. * Industry participation! We have a friendly observer who’s the lead software architect for one of the major UPS vendors. * A makerspace near me where the owner recruited himself onto the project and is looking forward to donating bench time and skilled hands to the hardware build. All this helpfulness almost – but not quite – fills in my deficits as a designer/implementer. I don’t really know from hardware design, so I’m attacking the problem with the modularity and information-hiding principles I know from software. An I2C bus that ties together a “forebrain” which is a Unix SBC, almost certainly at this point an Olimrx LIME2, with a “midbrain” that is an Arduino-class microcontroller. The forebrain will talk to a 20×4 LCD panel over I2C, and various other controls like alarm mute and self-test buttons via GPIO pins. 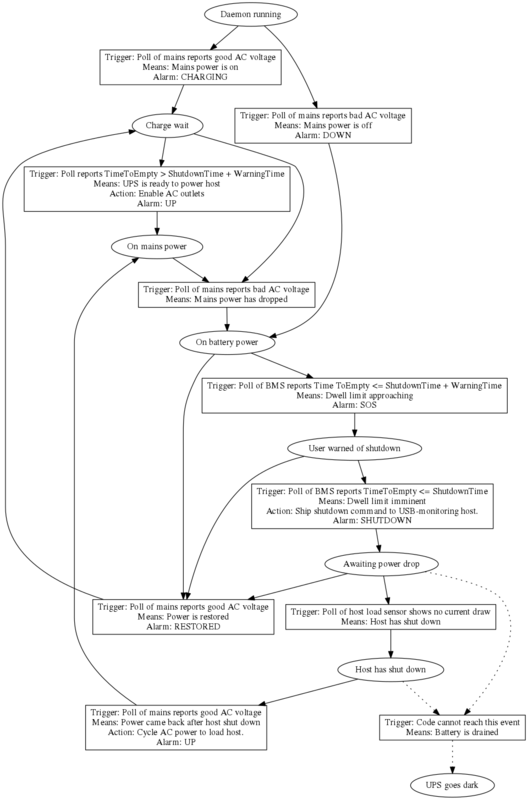 I realized early on that one of the first things I needed to do was draw a state/action diagram for the system so I could pin down its behavior in response to any given transition in its environment (mains power up, mains power down, battery dwell limit approaching, those sorts of things). So I reached for one of my favorite tools, a graph-drawing DSL called dot. Only when I write the first version of the graph, I found the dot markup cluttered and repetitive. So I wrote a couple of cpp macros named “state” and “action” that expand to dot markup, and expressed the graph as a sequence of macro calls. This, however, does not solve the entire firmware problem by any means. The midbrain’s going to need system logic to do things like receive and send I2C messages, poll A2D converters from sensors watching the mains and battery voltage, and so forth. WANTED: One firmware hacker. Must be familiar with AVR-class microcontrollers and the Linux toolchains for them. Experience with I2C and low-level programming of USB endpoints would be a plus. Perks of the job include getting one of the first UPSides made, your name in lights, and working with a dev crew that is impressive even by my elevated standards. EDIT: Well, that didn’t take long. A&D regular Jay Maynard has signed on. I’ve been getting a lot of suggestions about the brand new UPSide project recently. One of them nudged me into bringing a piece of implicit knowledge to the surface of my mind. Having made it conscious, I can now share it. I’ve said before that, on the unusual occasions I get to do it, I greatly enjoy whole-systems engineering – problems where hardware and software design inform each other and the whole is situated in an economic and human-factors context that really matters. I don’t kid myself that I’m among the best at this, not in the way that I know I’m (say) an A-list systems programmer or exceptionally good at a couple other specific things like DSLs. But one of the advantages of having been around the track a lot of times is that you see a lot of failures, and a lot of successes, and after a while your brain starts to extract patterns. You begin to know, without actually knowing that you know until a challenge elicits that knowledge. Here is a thing I know: A lot of whole-systems design has a serious drunk-under-the-streetlamp problem in its cost and complexity estimations. Smart system engineers counter-bias against this, and I’m going to tell you at least one important way to do that.